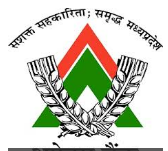 Short Information : Madhya Pradesh District Cooperative Banks APEX are Recently Uploaded Prelim Exam Result for the Post of Clerk, Computer Operator in Various District in MP. Those Candidates are Registered to the Following Vacancy and Can Read the Full Exam Instruction and Download Phase I Result. Pay Exam Fee Through Debit Card, Credit Card, Net Banking, UPI,Mobile Wallet or E Challan Fee Mode. Step 2: Enter Your Registration No/ Roll No. and Password/DOB.